PQ iPhone Video Converter is a One-Click, All-In-One solution to convert Tivo, DivX/Xvid movies, MPEG, WMV, AVI, RealMedia videos and many more to iPhone video. 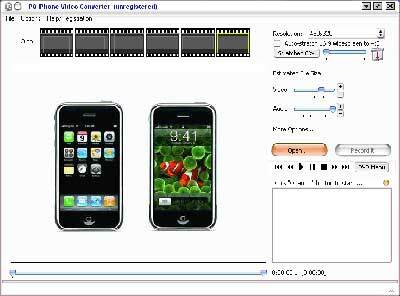 • 1-click direct video file to iPhone video conversion (also iPod). • Optimized for SSE2/SSE/MMX/3DNow! and graphic card acceleration. • Dolby Surround and DTS Surround audio are supported. • High quality video in H.264 and MPEG-4 iPhone video file format. • PQ iPhone Video Converter also supports iPhone to TV.